The Royal Mail has today announced plans to issue an extra set of stamps to mark the 2012 Paralympic Games. The set of four stamps will feature the Paralympic sports of wheelchair basketball, cycling, powerlifting and athletics alongside famous London landmarks such as St Paul’s Cathedral. They will go on sale on 29th August to coincide with the start of the games in London, Royal Mail confirmed today. A selection of the stamps issued by Royal Mail to mark each gold medal victory at London 2012. This new set is in addition to the stamps already announced by Royal Mail to mark each Paralympic gold medal. During London 2012, the Royal Mail issued a new stamp to mark each of the twenty-nine gold medals won by Team GB. Post boxes have been painted gold in the home town of each gold medal winning London 2012 athlete. 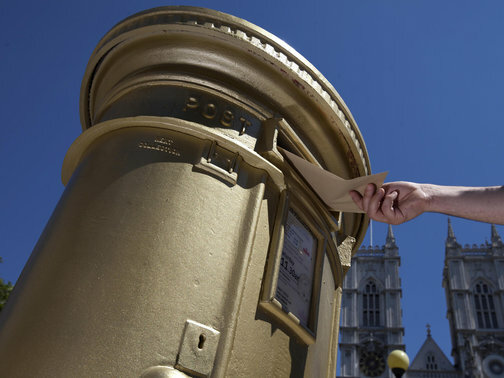 Similarly, the Royal Mail will also paint the post box gold in each home town of a gold medal winning Paralympian, just as it did for London 2012. “We hope these stamps will help get the nation excited about the Paralympic Games and encourage the public to support Paralympics GB when it’s our turn to compete against the best in the world,” says Tim Hollingsworth, Chief Executive of the British Paralympic Association. The Paralympics have grown significantly since the first games in Rome in 1960 when just 400 athletes from 23 countries participated in wheelchair sports only. This year, London will play host to over 4,200 Paralympians from around 150 countries who will take part in a total of 20 sports. These range from popular disciplines such as athletics, sailing and rowing to the less well-known boccia and goalball. As the athletes start to arrive in the Capital to complete their preparation, the Paralympic torch began its week-long journey on Wednesday 22nd August. This will culminate in a 24-hour relay from Stoke Mandeville, the birthplace of the Paralympic movement, to the Olympic Stadium, the site of the Opening Ceremony. At the Paralympics in Beijing in 2008, the British team won 42 gold medals. The games run until 9th September.